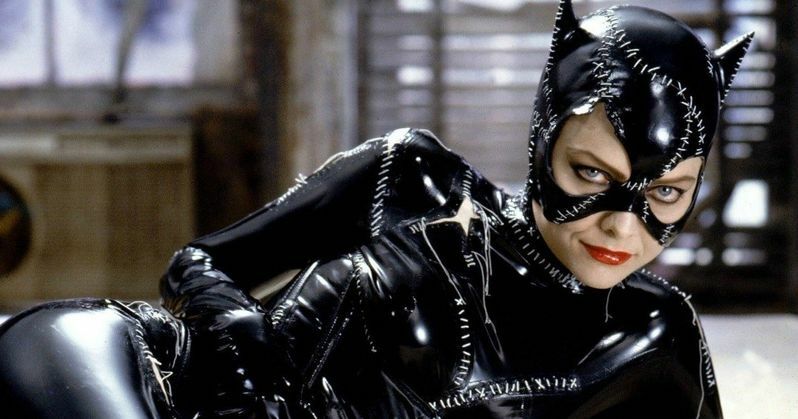 Responding to a #ShareYourRejections trend on Twitter, screenwriter John August revealed that he had pitched a Catwoman spin-off to Warner Bros. Pictures in 1998 that would have starred Michelle Pfeiffer, following the events of Batman Returns. Unfortunately, the idea was not picked up, but based on what August revealed, the movie would have been pure genius. John August is a rather experienced screenwriter in the movie industry, having written Big Fish, The Nines, Corpse Bride, Dark Shadows, Charlie and the Chocolate Factory, Frankenweenie, and Charlie's Angels. He also wrote the script for Disney's live-action Aladdin, which releases next year. His resume is incredibly impressive, but based on what we've seen so far of his Catwoman concept, his most impressive work never truly saw the light of day. Though John August didn't share his entire vision for his Catwoman script, he did share at least a few segments from the treatment. He did clarify that most of what he shared was only from around the first act of the movie, but based on the tone and events of what he shared, the movie would've been thrilling for those who go to Batman movies for the action and for those who go for the deep characters. The movie would have even featured a brief appearance from Batman / Bruce Wayne, which also would've helped to draw audiences in. Related: New images from Catwoman! The movie would've opened with Catwoman / Selina Kyle monologuing about her life in a psychiatrist's office, only to be revealed that it was just her sadistic way of robbing the place. Evidently, the cat-like anti-hero had returned to a life of crime following the events of Batman Returns. However, as the story continues, we start to notice that Catwoman is evidently upset with how her life turned out and that she's not living the "normal life" she dreamed of. Her prayers are soon answered after she is knocked out from an explosion, which effectively erases the Catwoman qualities and memories out of her mind. Selina then moves back with her family to try starting a normal life, which presumably ends up going wrong as her cat-like instinct starts to return. Unfortunately, as great of a movie as this would have been, Warner Bros. decided to pass. At first, the studio was apparently willing to use the script, but only if they could cast Buffy the Vampire Slayer star Sarah Michelle Gellar in the lead role, and include some hair-washing scene for some reason. All things considered, we shouldn't be too surprised that Warner Bros. passed on this great concept. Batman & Robin had just released a year prior, which kind of gives us a clue towards the mindset the studio executives were in in regards to superhero movies. Though we did eventually get a Catwoman movie in 2004 starring Halle Berry, it was nothing like this concept revealed by John August. To this day, Michelle Pfeiffer is still considered by many to be the best actress for Catwoman, so it would have been fantastic to have seen an entire movie based around her. Alas, this did not come to be, but below we at least have a few glimpses of what could have been. CONTEST: Win Halle Barry's Catwoman on DVD! CONTEST: Win huge prizes from Catwoman! The new Catwoman trailer is here!